Social Samosa’s weekly social media and digital marketing campaigns roundup this week features a list of campaigns from brands like Taco Bell, Big Bazaar and McDonald, Johnson, Britannia Nutrichoice and Mankind. While fast food major Taco Bell presented an interesting take on Potatoes through #MakepotatoGreat, Mankind through its corporate film Choti Chakri took onto #SpreadingKindness. Britannia NutriChoice launched a new hollywood trailer-like digital film titled When Oats Met Chocolate for the new NutriChoice Oats Chocolate and Almond Cookies. The film was conceptualised and produced by the Bangalore branch of J Walter Thompson. Read more here. Mankind released a new brand campaign titled #SpreadingKindness, that best encapsulates the company’s philosophy and mission. The campaign has been conceptualized and executed by ADK Fortune. It has been produced by Jamura films and directed by Tathagata Singa. Know more about the film here. JOHNSON’S celebrated 125 years of providing and enhancing baby care across the globe through its most-loved products. The brand dedicated this year to engaging with and listening to mothers who have shown their unwavering trust and love in the brand. Click here to know more. Taco Bell’s Make Potato Great campaign is based on rich content created by a dense network of A lister influencers. 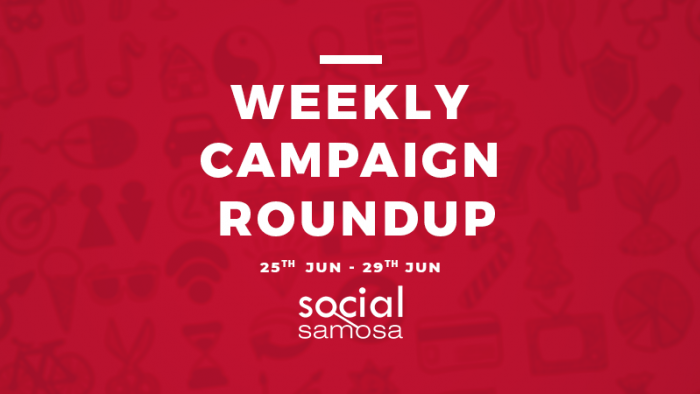 Social Samosa gets in conversation with Taco Bell and Ogilvy to take a look at the campaign journey. Get a deeper insight into the campaign here. Big Bazaar launched a Facebook augmented reality camera game built by AliveNow. Consumed in the Facebook Camera on the Facebook mobile app, there are no clicks, swipes or scrolls, the game is played by literally bouncing the soccer ball on your head. Know more about it here. McDonald’s latest FIFA World Cup ad is letting all the football fanatics over the world, with their eyes glued to the Television screen know, that no matter what, McDonald’s is there for you. Get a deeper look inside the campaign here.